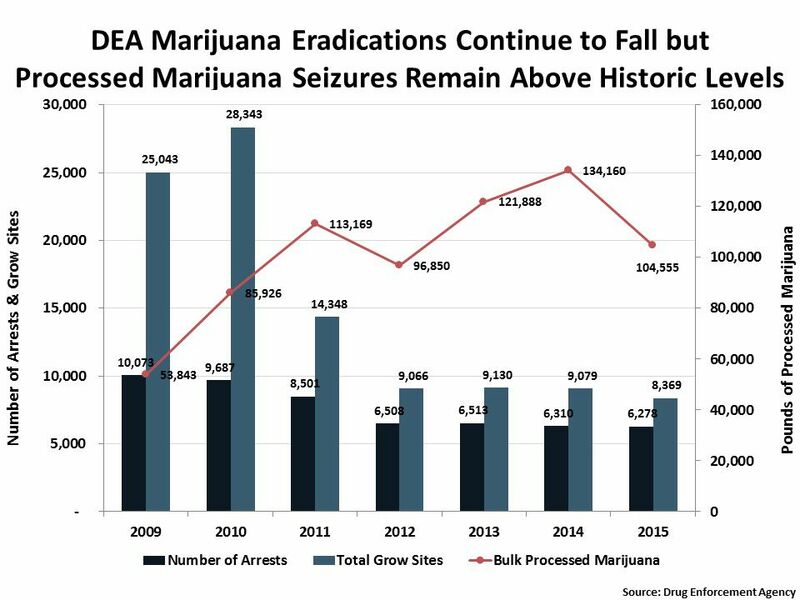 New figures released by the Drug Enforcement Agency show that the number of marijuana arrests and cultivation sites destroyed have continued to fall even as the amount of processed marijuana intercepted by the DEA has increased. Between 2009 to 2015 marijuana arrests declined nearly 40% and the number of grow sites destroyed fell by 67%. During the same period, the amount of bulk processed marijuana seized has almost doubled. With Congress tightly restricting the DEA’s marijuana enforcement budget and limiting action in states where marijuana is legal, the downward trend in federal marijuana law enforcement is expected to continue in the coming years.